First entering the present-day American Southwest around 1500, the Apaches established themselves in the face of competition from the Spanish, Mexicans, and Americans. After decades of fierce resistance, the Apache tribes eventually found themselves facing an assault on their culture as they were confined to reservations and their children sent to boarding schools. Nevertheless the people found new ways to preserve their culture and sense of nationhood even as they learned to navigate the changing social, political, and economic landscape of modern America. Today, most Apache still live in the states of Arizona, New Mexico, and Oklahoma, where the principal Apache reservations are located. 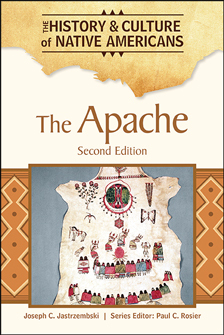 In The Apache, Second Edition, read how this proud people thrived in America, interacted with Europeans, and live today. Full-color and black-and-white photographs, maps, sidebars, a glossary, and other reference features make this narrative history perfect for school libraries and general collections. Joseph C. Jastrzembski is professor of history and coordinator of the Native American Studies Program at Minot State University in North Dakota. He specializes in 19th-century Native American history. His research interests include the cultures of the Southwest and Plains, ethnohistory, folklore, and museum studies. Jastrzembski is also codirector of the Mandan Language and Oral Traditions Preservation Project.